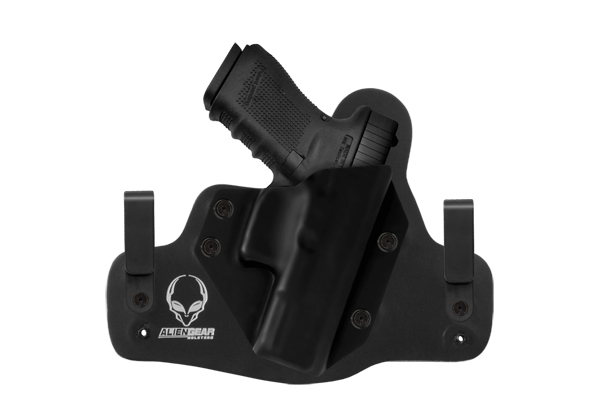 10 retention holsters mixing speedy access with gun-grab-proof security! 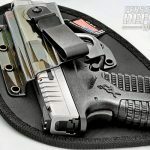 Retention holsters are form fit to an individual model and designed to use the gun’s physical contours as a means of locking it into the holster pouch without any additional safety restraints. 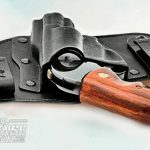 Think of it as the old leather holster-maker’s term “wet forming,” only in this case the holster is formed around a metal mold of the gun to fit every detail of the frame, barrel, sights and triggerguard. 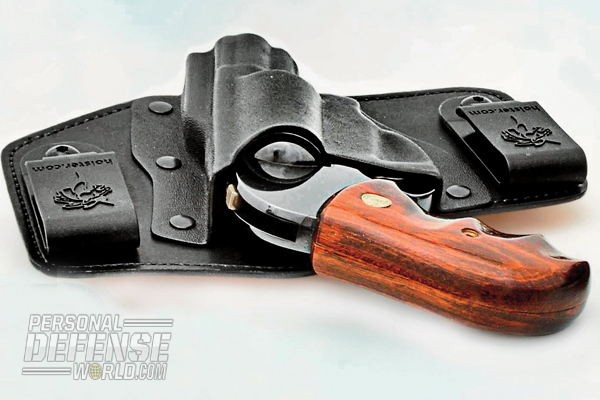 Read on to learn more about 10 retention holsters making waves in the marketplace. 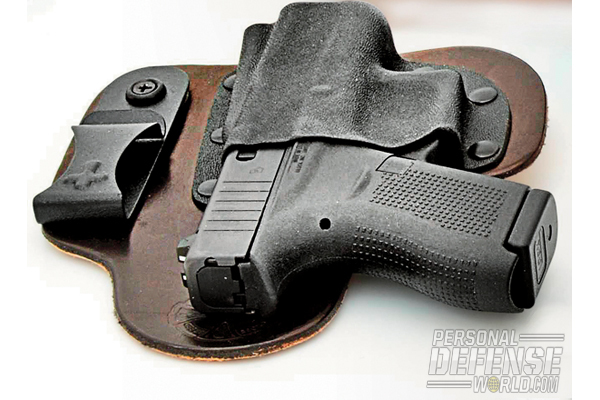 If a holster is designed to maximize concealment, it is likely an IWB. 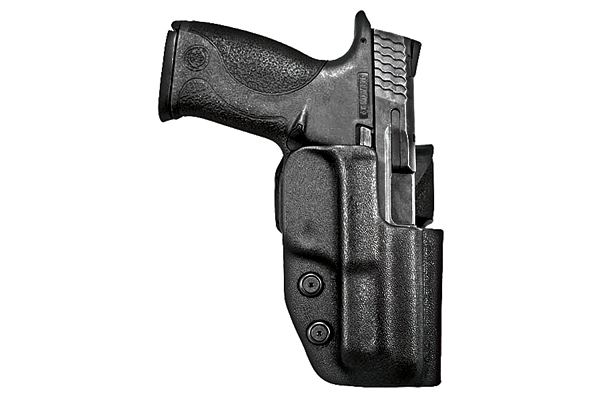 Modern designs like the N82 Tactical holster provide a combination of polycarbonate material to create a form-fitting pouch for the firearm, all attached to an oil-tanned leather skirt with a sheet of neoprene (the same stuff wetsuits are made from) that’s sandwiched between the front of the skirt and a soft suede backing to rest against your skin or undershirt. What rests against your body is soft and pliable. 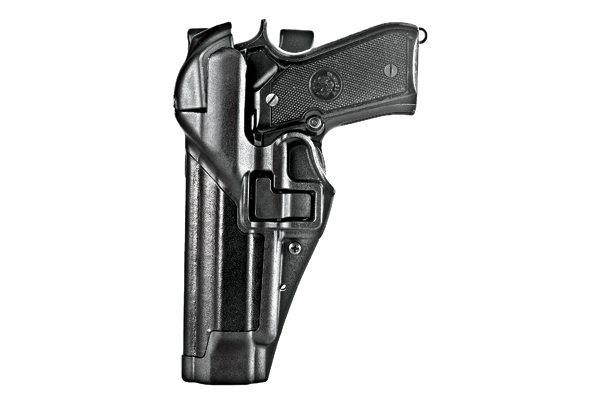 It’s an approach taken by Beretta for its Amadini Ghost Holsters. 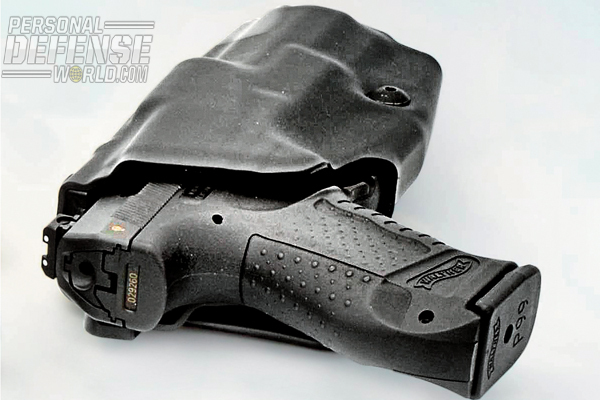 The DeSantis Intruder line of IWB rigs uses a combination of a form-fit Kydex pouch riveted to a leather skirt, again separating the pouch and firearm from being in contact with your body. 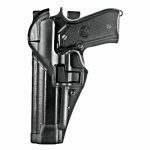 The Intruder firmly engages the triggerguard, and the DeSantis line is available to fit a host of revolvers and semi-autos, providing maximum concealment with the security of full firearm retention. 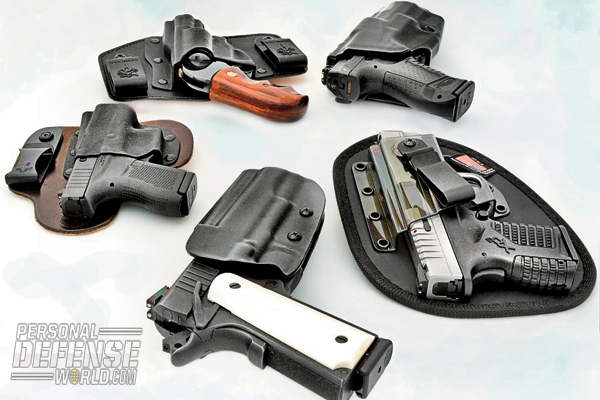 CrossBreed Holsters offers a similar design with a Kydex pouch with premium leather backers available in Cowhide, Horsehide or a Premium Hard Rolled Cowhide. 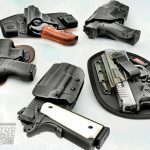 CrossBreed Holsters are also height and cant adjustable, making them ideal for a wide range of firearms, from small pocket pistols to full-size 1911s. 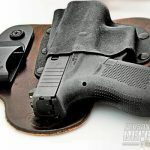 Alien Gear’s Cloak Tuck IWB holster features a standard-sized leather backing allowing users to swap out the Kydex shell, depending on the gun they wish to carry, while retaining the same comfortable, broken leather skirt. 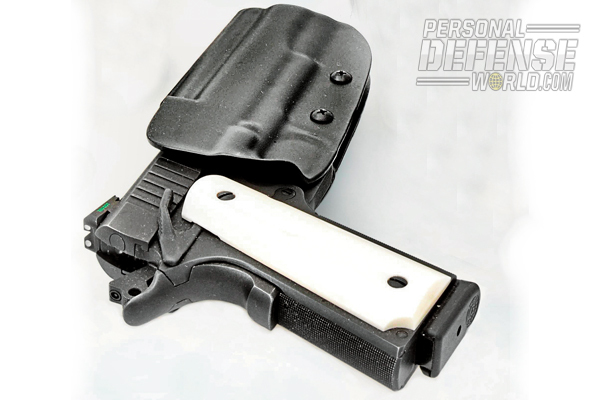 If you are not going with an IWB, a paddle holster is another excellent alternative. 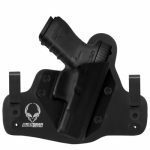 They are easier to mount than a belt holster, and a paddle rig can also be quickly positioned anywhere around your waist as situations dictate, from a strong-side 2 o’clock (appendix) or 3 o’clock (hip) position to a more covert 4 o’clock or back of the hip location. 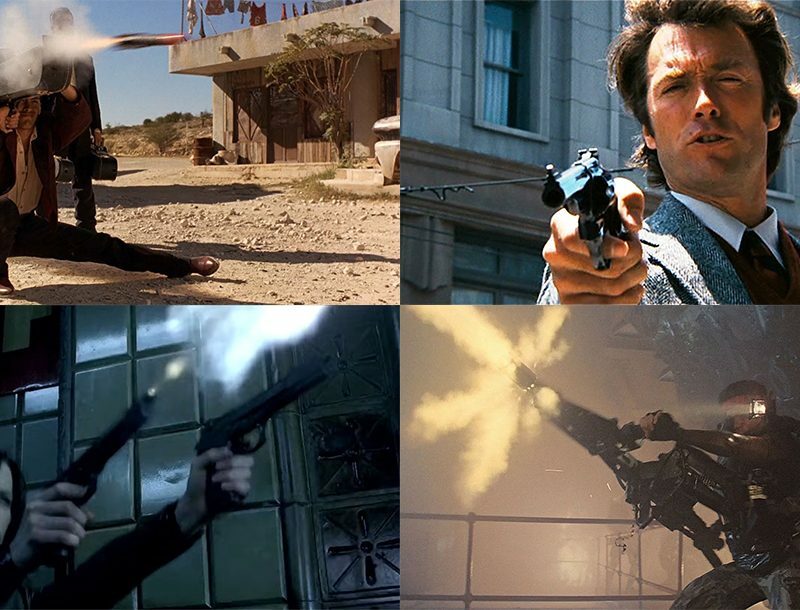 Those that are cant adjustable (most are these days) can also be adjusted to work for crossdraw wear. 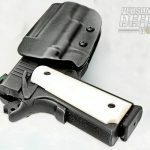 A variety of manufacturers, including Blade-Tech, offer interchangeable back plates so a holster can be switched from belt wear to paddle mount in a matter of minutes, offering excellent versatility with one holster. 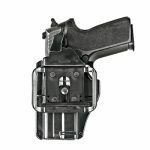 Every retention holster has its advantages and disadvantages, the latter being wear to the gun’s finish over time. 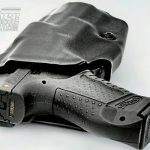 Some makers such as Safariland deal with this by lining thermal-molded holsters with a suede leather interior; Safariland’s 7TS injection-molded series has a finish so smooth that wear is unlikely during normal use. 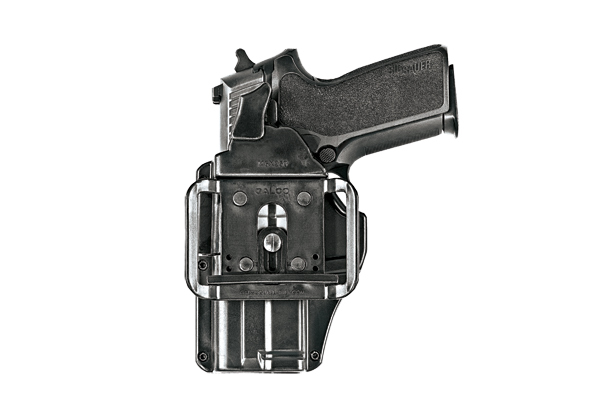 Some retention holsters like the Comp-Tac Belt Holster are injection molded (or combination leather and molded) and utilize a locking device similar in concept to the very first retention holsters (like the upside-down Berns-Martin), albeit replacing snap-spring retention for molded contours that lock around a revolver’s cylinder or into the ejection port of a semi-auto. To draw, simply twist and pull upward. 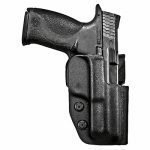 A retention holster like the Galco M6X adds a secondary lock, such as a release by pressed downwardly by the thumb when drawing. 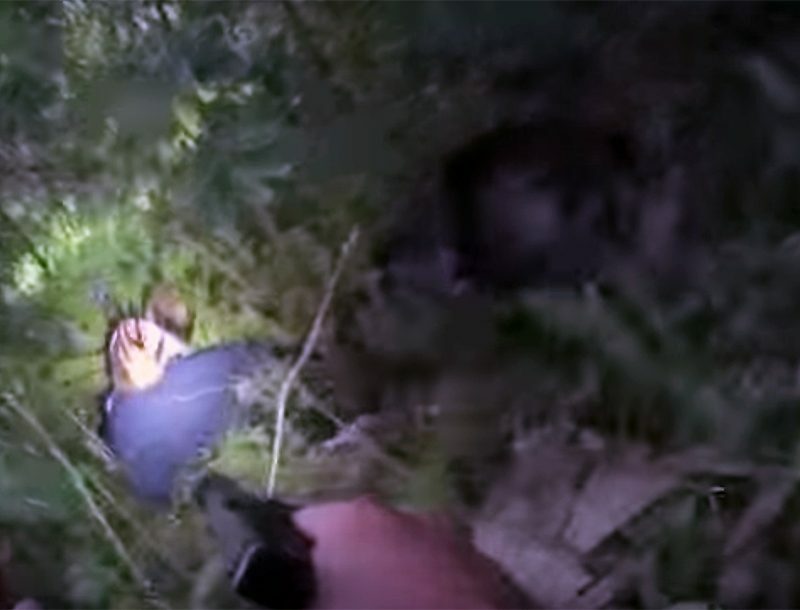 Doing so raises a rotating catch locked into either the triggerguard or the slide’s ejection port. 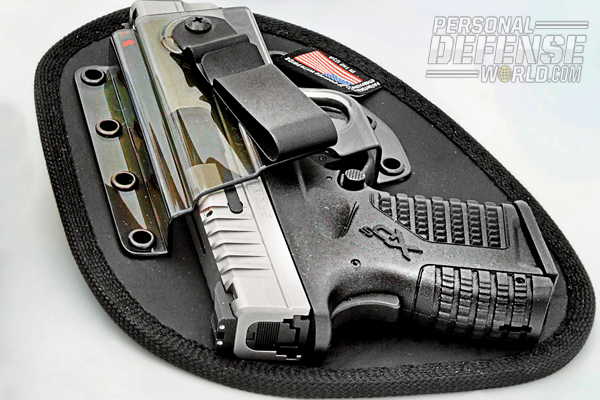 Blackhawk SERPA holsters use a third lock, such as a hood that covers the slide, preventing drawing. 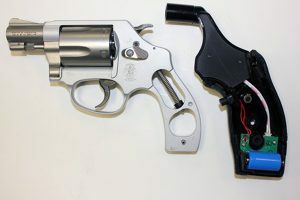 When dual locks are employed, both the thumb and trigger finger, one acting on the ejection port and the other on the triggerguard, must be used to release them before drawing. Additional security features can be added, but for most, even law enforcement, this evel of security is optimal.